This series is also known as The Southern Vampire Mysteries. This review has been edited. Original review was posted in 2012. See Goodreads link at end of post. I was first introduced to the Sookie Stackhouse series by a few friends who thought I'd be interested because I'd expressed interest in fantasy novels. I suppose I never really made clear that the fantasy novels I meant were more along the lines of adventure and high fantasy, and not so much the Urban Fantasy, paranormal sub-genres of fantasy. And yet still, I found myself wondering, after being disappointed with several other popularly trending books/series, if I'm capable of liking any mainstream bestsellers that everyone else seems to adore. Of course, I have to admit that Dead Until Dark really did start out with a good concept and a good set-up. 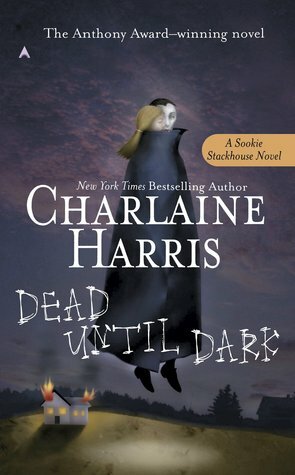 The world of Sookie Stackhouse is a little bit hard to buy into, but I got through that initial suspension of disbelief thanks to the pacing of the story's development. It's an interesting world with a lot of potential. Sookie Stackhouse introduces herself as a telepath, calling her talent a disability, and then proceeds to walk us quickly into this alternate universe where vampires have announced their existence to the world. We get to see a lot of true-to-form prejudices and realistic reactions of the people to a type of being way different from humans. Obviously vampires aren't human even if maybe they used to be. And obviously it's a bit hard to live in harmony with creatures that drink your blood and could possibly drain your life away. Just sayin'. And so the world of this series is set up rather well... it's not the best concept, but I can live with it. And then when the murder mysteries began, I was intrigued. Very intrigued. Because I like mysteries. However, we quickly take a backseat with the murder mystery in favor of Sookie and her romance with Bill Compton, the vampire. A vampire. Named Bill. Bill Compton... the vampire. I admit, I needed a bit of time to process that. But being as how vampires are technically undead human beings that got transformed somehow, I hedged that I was being a bit harsh about the vampire's given name. After all, not ALL vampires have to be named Dracula or something Gothically romantic like that, right? While I appreciate the realistic presentation of human nature in dealing with Sookie's relationship with Bill, I really think I could have used a little less of their romance and a little more of Sookie helping to solve the murder mysteries. She has this psychic talent for a reason, but most of the time I felt like we kept forgetting that Sookie can read minds and that someone was just killed in what seemed to be vampire fashion--blood drained, small puncture wounds. After the third or forth bedroom scene--that actually felt kind of forced, really--I started to get a little bored with the Sookie Stackhouse life. Was her entire being really based around the romance she had with Bill the vampire? It sure seemed like that was all she cared about. I mean, I'm glad that Sookie is a tough cookie and can stand up for herself when it matters. I'm glad that she's not your typical heroine. But she still managed to let herself be pushed around by the man--or vampire--she declares that she has fallen in love with. Of course, it also doesn't help her own personality that she's also quite wishy-washy with that hot-cold personality. It irked me a little that she seemed to get angry or jealous at Bill for a LOT of trivial things. And it also irked me a lot that she constantly referred to herself as stupid and uneducated, but then she turns around and condemns other people for indirectly implying that she's stupid and uneducated. Her mind frame had a lot of contradicting ideals which made me not quite care for Sookie as a person. Finally, her romance with Bill really doesn't have that feel of love to it more than it actually feels like lust; she becomes quite attracted to a lot of the other good-looking men in the story, and even has thoughts about sleeping with them as well, even after claiming how much she's in love with Bill. Call me old-fashioned, but I hardly think it's appropriate for anyone to have thoughts about sleeping with someone else if you're with someone already whom you claim to be devotedly in love with. Then again, maybe I've misinterpreted some things in there, because a lot of the story seemed like filler that I read through and didn't quite commit to memory or anything. Overall, I thought the book was fine, but not really as great as most have given it praise for. I mean, really, slap one of those Harlequin for romance novel covers on this one and it wouldn't really make much of a difference. It just so happens that this one is based in a paranormal alternate universe with an insignificant murder mystery to keep us curious. It's no more unique than all the other romance novels out there. It just happens to be kind of riding the vampire-human romance boom that suddenly got catapulted into the world. Will I read the next book? Maybe. I might pick it up just to see if it handles the murder mystery a little bit better. For one, the other name that this series goes by is the Southern Vampire Mysteries, and thus, I expected more mystery... at least more than I was given. So it wasn't exactly my favorite book, or even one that I would care to come back and read. Then again, it wasn't like it was altogether terrible, so it has its positives.